Wine Tasting Notes – Page 3 – GARGANTUAN WINE. Homemade côte de boeuf and sauce Choron. 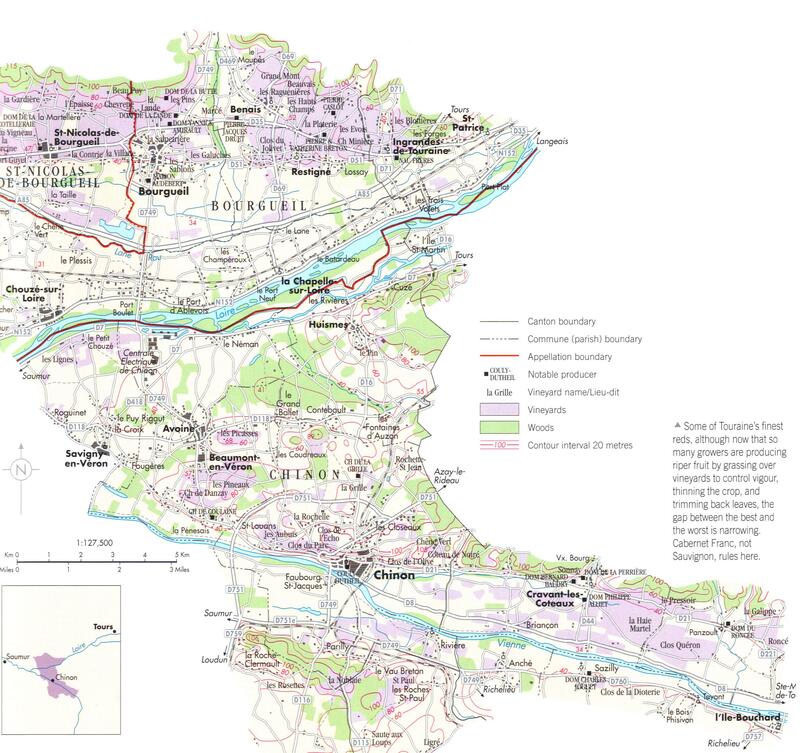 Given this blog’s obvious indebtedness to François Rabelais, it’s long overdue that I sing praises of Loire Cabernet Franc — particularly Chinon. Last Thursday, thanks in large part to Thierry Germain, I discovered the most perfect food pairing in the universe for Loire Cabernet Franc. 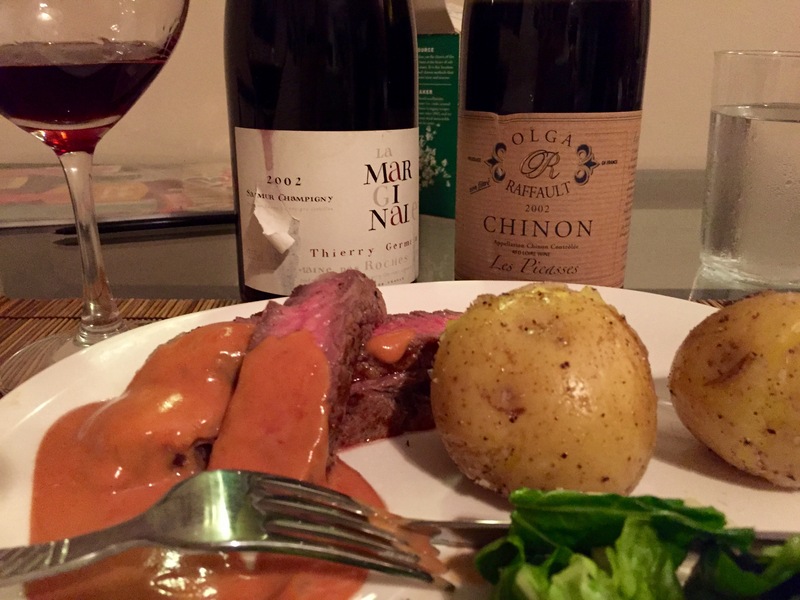 With a friend, we threw together an impromptu dinner contrasting two Loire Cabernet Francs from the same vintage: a 2002 Domaine des Roches Neuves Saumur-Champigny “La Marginale”, and a 2002 Olga Raffault Chinon “Les Picasses”. These are two benchmark Cab Francs from an excellent, sun-drenched, warm vintage. Thierry Germain’s Domaine des Roches Neuves “La Marginale” is his tête de cuvée wine, only made in the best vintages. A portion of the vines for La Marginale reside in the fabled lieu-dit “Poyeux” (of Clos Rougeard fame) in Varrains, and the other comes from other vines around Chacé; Olga Raffault’s Picasses is sourced from its own revered vineyard in the northwest of Chinon. 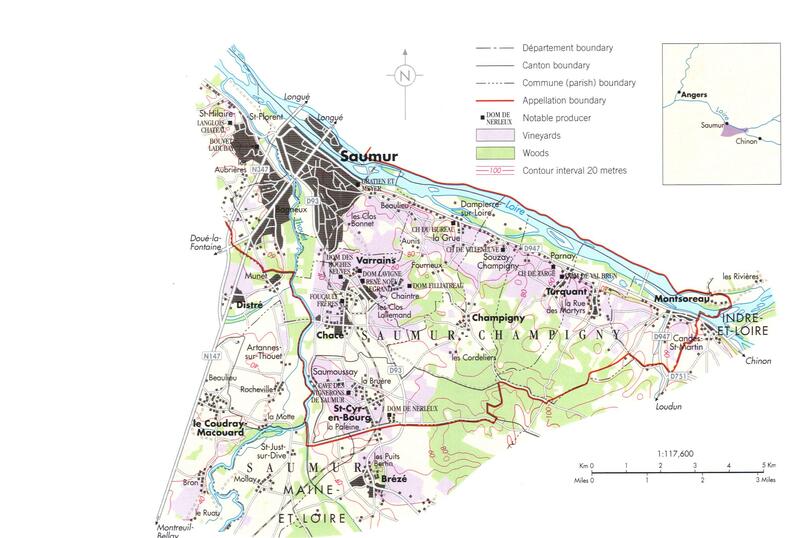 Here are maps of Saumur and Chinon. Thierry Germain is clearly a bon vivant, and meticulous in all he does; he is one of the only winemakers whose technical sheets offer not one, but twelve different food pairings. Are you always adding slices of lemon to your drinking water? If so, you’re not just doing something healthy, you’re predisposed to amazing, undervalued Portuguese white wines. You crave acid and citrus — the very heart and soul of Portuguese whites grown in granite soils. Portugal’s wines must be the most undervalued in the world. While most of us can’t afford to buy aged wine in its prime, in Portugal, you can. You don’t need a cellar and 10 years’ patience; you just need a cheap flight to Lisbon, some AirBnB research, and an empty suitcase with enough wool socks for your bottles. While every other wine region is struggling to fool folks into believing their wines are blessed with this generation’s buzzwords — freshness, acidity, unique indigenous grapes, and enough tannins to improve with age — Portugal actually delivers. It’s an irrefutable truth whose meaning sets in via your gums once you’ve tasted through your first dozen Portuguese wines. The wines call for food: they are crafted for them.